Below is a list of clients the Medingenuity has helped with business development, web design, corporate identity and branding, or direct-to-consumer communications for ambulatory surgery centers. 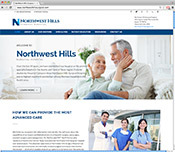 Northwest Hills Surgical Hospital is based in the Austin, Texas market. The facility’s existing Internet site was unable to cut through the competitive clutter of the major Austin market. For all target key words, their existing site never appeared in the top 100 on Google for organic search. Medingenuity developed a new content-rich Internet presence for 2018 using it’s copyrighted educational material on orthopedics and other specialties. Within two months after the new Medingenuity site was launched, it was appearing in the top 10 on Google for organic search. 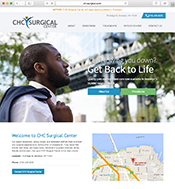 CHC Surgical Center is the first dedicated pain management center in Brooklyn, New York. The new Ambulatory Surgery Center called on Medingenuity to develop the corporate identity, new educational Internet presence and other marketing materials for a successful launch in early 2016. Medingenuity continues to be its agency of record for various marketing and referral development activities. Southern New Mexico Surgery Center, LLC provides complete perioperative services for operative and other invasive procedures, including the immediate postoperative phase. The care provided is not limited to surgical intervention, but also embraces the psychological, social and spiritual dimensions of the patients and their families. 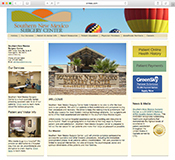 MedIngenuity was tasked with creating a new website for Southern New Mexico Surgery Center that included new content and downloadable patient intake forms.